Very fun, Diane! I love the idea of a hero writer. Perhaps he can use his tales of rescue in his writing work :) Thanks so much for joining in the contest! Thanks,Susanna, for creating such a fun contest. Nice! Very imaginative, a little crazy, and lots of odd-ball names for people, towns, and things. This is definitely you! Nice story. Thank you, Sue, for understanding the creative madness of this writer. You know me well. Diane, very creative and I love all the names! Thank you, Joanna. I enjoyed your story, also. Keep up the great work. I love the off-handed, mundane feeling of this hero's job. So oppossed to the typical hero story! Very entertaining. Thanks, Laura, for dropping by and sharing. Your story was wonderful, too. So creative!!! I love the names of the characters and the premise of your story! You did a great job with voice all the way through! Hi Penny. Thank you for your kind words and for visiting my site. Hi Diane...so nice to connect via Susanna's awesome contest! Hi Vivian. Thanks for dropping by. You're right, lots of us writers feel that way: Hero by day, writer by night. I'm heading over to Susanna's awesome contest again. Hope to see you there. Thank you, Erik. 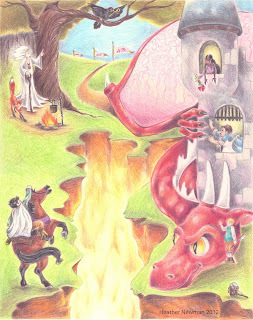 I love dragons and I love dragon stories. Snarls says "Hi." Hero writers...brilliant! Such a fun story! Thanks,Kim, for dropping by and your kind words. My favorite line: I have tricked him with such lures as; home movies, dancing girls, jugglers, and his favorite, Mars bars. Now that's MY kind of hero! Best of luck in the contest! Thanks you, Cathy. And thanks so much for stopping by and commenting. I really appreciate it. The best of luck to you also. Ahh, the challenges of life as a hero-writer. I'm glad Susanna's contest introduced me to your blog. Hi Lauri. Thanks so much for dropping by. Ahh, it takes a hero writer to know a hero writer. Take care. Good luck.